Inside: reports from the floor, celebrity sightings, unboxings, items iPad buyers say they would buy if Apple made them, and most importantly, sales predictions. The entire Internet exploded with the word “iPad” today. Nine out of ten tweets in my Twitter feed are iPad-related, from such varied sources as cookbook writer extraordinaire Michael Ruhlman, comedians like Paul Scheer, Steve Agee, and Conan O’Brien, and Greatest American Roger Ebert. (Andrew WK, for the record, spent the day tweeting about bananas, and opined that “when you eat bananas, you’re partying hard.”) Here are the various first-day shenanigans you should know about. Munster upped his previous estimate of 300,000 iPads sold in this opening weekend to a whopping 600,000 to 700,000 sold in the very first day. 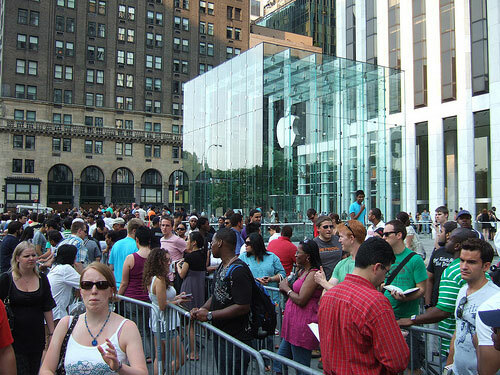 But it’s also important to note that those crazy, hundreds-strong lines of people waiting all night to get their hands on the iPad were mostly unnecessary–there are just about no reports of any store selling out of the iPad, and by early afternoon, the lines had slowed to a crawl, with Apple Store employees putting away the riot-gear equipment they’d set up to deal with the crowds. If you got to the store at 9 a.m., you’d wait for an hour–get there at 2 p.m., you could just waltz right in and pick one up. According to an anonymous Apple Store employee, the 16GB version was selling the fastest, and did in some cases sell out. The higher-capacity 32GB and 64GB versions seemed to be less popular; perhaps buyers willing to spend upwards of $600 are waiting for the release of the 3G-enabled iPad in a few weeks. Interestingly, considering that there seems to be no shortage of iPads at all, the tablets are still popping up on eBay with accompanying markups. This 64GB iPad, for example, sells for $700 in the store, and $1,000 on eBay. Presumably the eBayers are selling to international customers, as the iPad won’t be available outside the U.S. for a few weeks or months (though there are numerous reports of Canadians slyly sneaking across the border to smuggle iPads back to their home nation). Oh, and in the San Francisco store, there was a 9-year-old kid dressed as an iPad. Newspapers, Twitter, Facebook, and every other possible way to spread word about the iPad was used in full force today–which means, of course, that some jokes will be recycled. After reading in the Wall Street Journal that one crazed Apple fan claimed, “I’d buy a toilet if they made it,” I went on the hunt for more examples. What other unexpected products would Apple fans buy, if their favorite tech company chose to release them?